Your resume is meant to be a potluck of the best you have to offer, organized so an employer can see the meat of your experience before the potatoes and pumpkin pie of skills and volunteer work. Your resume is your first impression before an employer even meets you — so your very best self has to shine through. You want a potential employer to be pleasantly surprised at how well you fit their company and they cannot help but reach out for an interview. However, there are a few common mistakes that can hinder the naïve applicant if not caught beforehand. 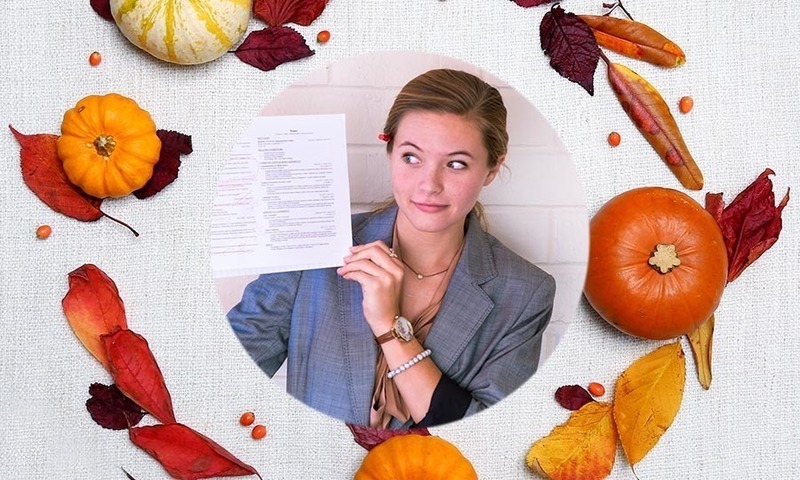 Thanksgiving is a time to celebrate, and after you read this, you’ll be thankful you won’t make these common resume mess-ups! This one is common because most people formulate their resumes off of templates they find in Microsoft Word or MacBook Pages. While templates are a good springboard to greater success, they can easily become more distracting than helpful. When the font choice and order of resume elements makes the reader struggle to find you, consider simplifying. Solution: Ask a friend (or your friendly neighborhood peer resume reviewer!) to look over it and ask if it is difficult to read. Ask questions like: Can you tell what I want to do? Does it show who I am beyond my experiences? *Exception: if you are a graphic design or art major applying to an art-related position. Artsy people have a lot of freedom in presenting their skills on their resumes. Bullet points (or the small fragment-sentences in your “Experience” section that describe what you did in that job) are the bane of resume writing. There is no easy way to figure out just how to market your transferable skills best. Often, bullet points will start out as full paragraphs or full sentences. This isn’t what an employer will be looking for. Solution: Bullet point writing may haunt your nightmares, but the Career Center can lend a helping hand in defeating them! The bullet point formula is: Action Verb + Task (with transferable skill) + Outcome. You can find a list of action verbs in the Resources Tab in the “Resume Writing” article on handshake. Anything that makes an employer trip up on reading through your resume is a red flag. Reading your resume should be an easy process, and they should know enough about you on their first 10-second glance to know whether or not you fit their needs. Solution: Type out the formula you are going to use for your resume elements beforehand, and make sure each one fits with it. The “before college time” is a gray area for college students until their sophomore year. At that point, there should be substantial experience from college work, classes and awards to provide information. Also, experiences from working in college are much more important to employers than high school-era responsibilities and awards. Solution: Nix the high school work and awards after your sophomore year of college. Don’t be afraid of putting every single experience you have on a huge document (I call this your burrito resume). Just be sure to submit a fine-tuned, one-page, tailored version of this (the taco resume) on a job application. Pick and choose which experiences fit best and include those when applying. Solution: When in doubt, type it out! Finally, the Career Center is on campus in Sutherland Hall if these mistakes find their way onto your resume. This isn’t an endeavor to conquer on your own — we’re here to help! You can schedule an appointment to have your resume reviewed or have it reviewed online. If you fear there are more mistakes lurking between the lines, we can uncover them and assist in marketing you to the big, scary world after Biola! And to celebrate your resume success, have a Happy Thanksgiving! Help Me With My Resume!